My gosh, how are we well into the new year already? I cannot believe that the holiday season is behind us. I am always a little sad to take down all of our Christmas decor, but this year, I was super bummed to have to put it away. This past season was so magical, with Henley able to understand and get excited over everything. It was especially hard to say goodbye to Chrissy, our Elf on the Shelf. Henley was looking for her for a week after Christmas! To fill the void of holiday spirit in the house, I started to break out my Valentine's Day things. While not quite as exciting as Christmas, it is a holiday that is all about pink and girlie things, so I'm sure Henley and I will have some fun with it. 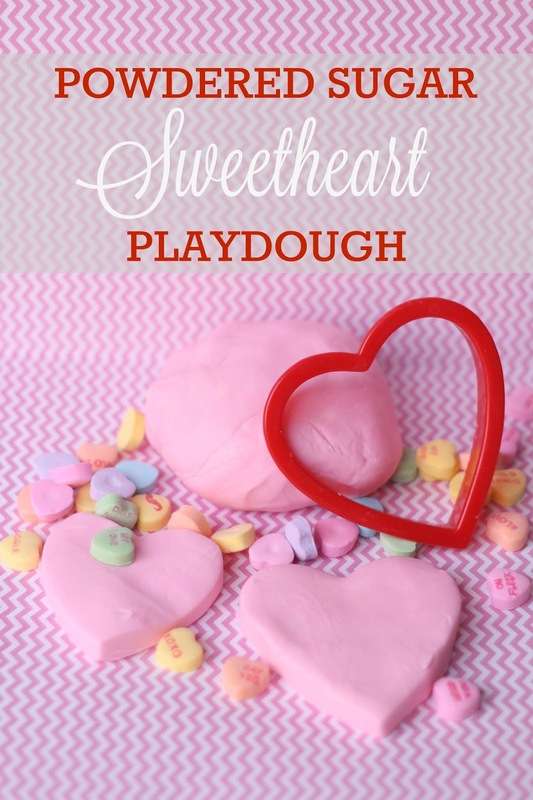 Here is the first Valentine themed project of the season: we turned a recipe for Powdered Sugar Playdough into pink "sweetheart" play dough. Not only is this project is quick and easy to make, it is edible! So, even your littlest ones can get in on the fun, but be warned...once they get a taste of this stuff, its hard to get them to stop! Scoop 1/2 C of frosting into your mixing bowl. With your mixer on low, slowly add in powdered sugar. After about a cup has been added, test your dough and see how sticky it is. Add the rest of your sugar very slowly and keep testing your dough. It will be ready once it no longer sticks to your hands (you may need a little more powdered sugar than called for). If you add too much powdered sugar, you can remedy your stiff dough by adding a little olive oil/canola oil to the mix. Once you are satisfied with the dough's consistency, add food coloring if you wish. Have fun! We used cookie cutters, utensils, and Sweethearts candies to play with ours. When finished playing, you can store your playdough in an airtight container or Ziplock bag for up to two weeks. Hope your littles love this project as much as mine did!